충청북도 청원군 노계산의 대청댐 수몰지역 내에 있던 박장군 묘라고 알려진 무연고 분묘에서 출토된 일괄유물이다. 묘주가 확실하지 않고 박장군 묘라고 전해지는 분묘에서 출토된 것이므로 확실한 연대는 알 수 없으나, 출토유물의 형태와 옷감의 무늬 등을 추정하여 볼 때 임진왜란 후 17세기 초기의 유물로 판단된다. The artifacts were excavated from a tomb, or General Bak's grave, which was located at an area submerged by Daecheong Dam near Nogyesan Mountain, Cheongwon-gun, Chungcheongbuk-do. Since the owner of the tomb is not known, the date of the artifacts is not clear either; based on the style of pattern of the artifacts excavated from the tomb, however, the artifacts are probably from the early 17th century or after the Japanese invasion of Korea in 1592. 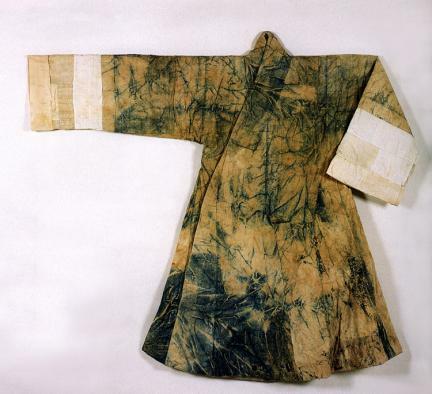 The artifacts include one dallyeong (courtier’s ceremonial robe), two pieces of jungchimak (topcoat), two jangot (lady’s veil), one bangryeong (topcoat with square collar), one dopo (topcoat), and one gwadu (lined underwear jacket) as well as twelve jeogori (jackets), two trousers, three skirts, one jokduri (bride’s headpiece), and two hats. Burial costumes such as two cheongeum (outermost shroud), one myeongmok (head shroud), and one aksu (hand shroud) were also discovered, for a total of 33 artifacts. Two sangtu (top hair knots) resembling the head of the corpse were also unearthed. This relic is considered to be valuable since it shows the hairstyle of men at that time.